← Life is what happens to you while you’re busy making other plans. Long ago, I formulated the Law of Unintended Consequences. It goes something like this – whatever I expect to happen in the future, it will not; something else will happen, something I have not even considered. The Law offers constant surprises, some good, some bad; the unpredictability of it all makes life infinitely interesting. I am constantly standing somewhere with a goofy smile on my face muttering; “I sure didn’t see that coming”. Travel intensifies our experience with the Law of Unintended Consequences; how can we know what’s ahead if we haven’t been there? 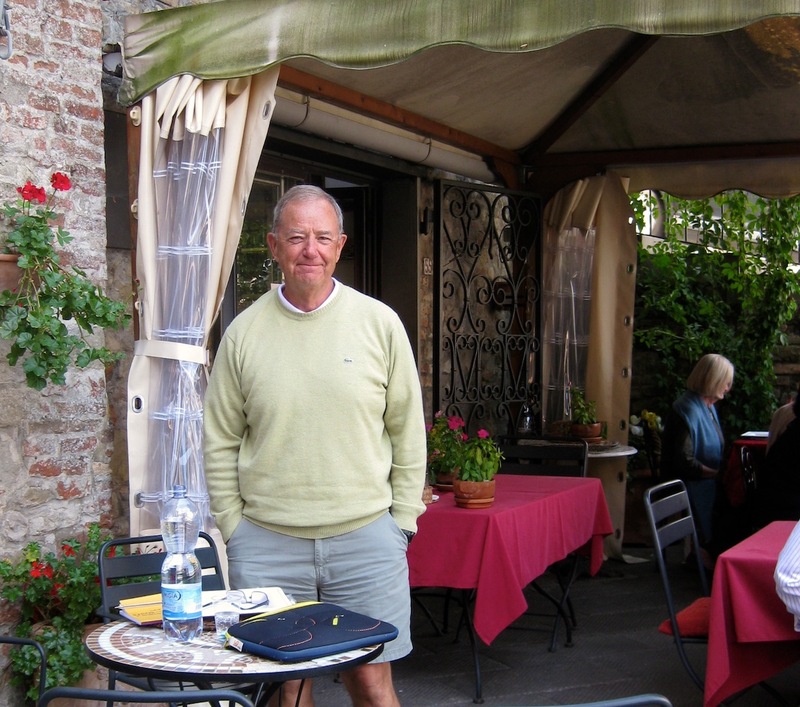 Italy 2014 is my latest lesson in the Law, up close and personal. One minute, I’m walking upright, planning to trek across Italy’s back roads, see it’s sights and sites; the next, I trip, I fall. A few broken toes, a trip to the doctor, and – Voila – my plans are dust. Instead, I rent Skippy, my Fiat 500, and we set off to drive where I had planned to walk. I have discovered a new Italy; it’s not in any guidebook, it’s not dressed in superlatives, like the David in Florence or the Sistine Chapel, but it’s all mine. First. I may never buy a Fiat 500 but I have, on high recommendation from a knowledgeable traveller, discovered Skippy can be fun and I have made him my friend – anthropomorphic transformation works. We are having fun. Another. Last Sunday, I arrived early in Sansepolcro, a small town, usually bypassed by tourists. 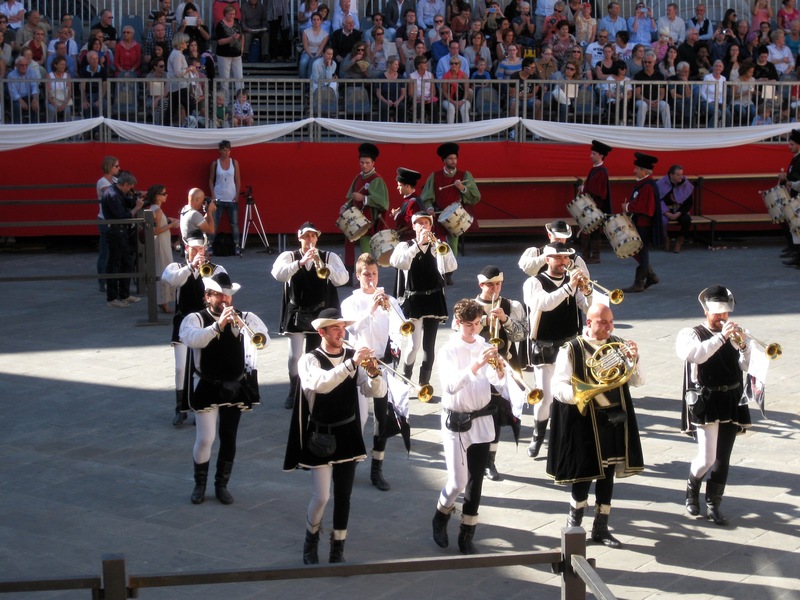 It is the last day of a festival traced back to Medieval times – an annual crossbow competition between Sansepulcro and Gubbio, a neighboring town. I manage to get tickets – ringside seats – to what, I did not know. My new friends, Norm and Kim from Edmonton – another example of the Law, join me. 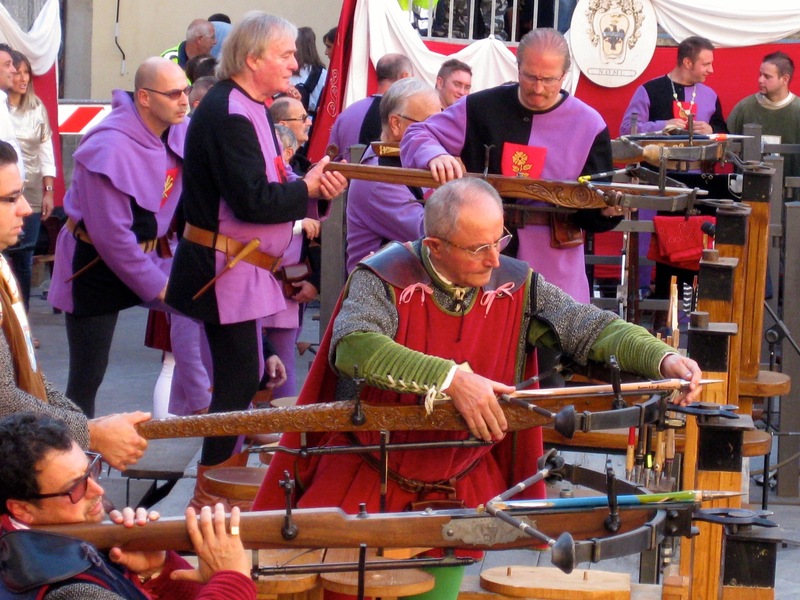 The medieval crossbow event is priceless; an hour of procession and pageantry including marching musicians, grandiose noblemen, puffed up pillars of the church, damsels, flagbearers and archers – hundreds, all dressed in colorful renaissance costumes. Huge crossbows are carefully mounted on stands, aimed by the archers; a charged bow violently blasts an arrow into a small white target 500 meters away. Most arrows, surprisingly, pierce the target; other arrows pierce them as they pile in on top of each other. The next day, bold headlines in the local papers announce Sansepulcro has won! Whew…! Yet another. The next day, I am off to Citerna, a hill-top village. If I had been walking, I would have traversed it, too much up to climb. But Skippy and I climbed the steep slope in time to watch the village come alive. What a village! It is a fortress dating back to the 1500’s, designed to withstand any assault. Now it is immaculate and welcoming to tourists. The view over the Tiber River Valley is endless. The Apennines frame the horizon, the sky is blue. Life is good. At 9 AM the locals congregate at the only cafe to share the morning news, at noon, the place seems to be dead; magically at 1 PM the center square is teeming with tourists and locals. A nondescript grocery store has become a lively restaurant. I catch a small seat on the edge of the outdoor cafe and fall in love with Signora, her Caprese salad and her prosciutto e melon. I am addicted. If I didn’t look down my nose at picture-taking food-pornies, I would show you a photo of the best Italian lunch ever plated for 10 euros. Is this heaven; no, it is Citerna. And another. Two days later, I cautiously wend my way to Carravechio (a place that doesn’t really exist on any map) to a small self-described eco-farm called Associazzione Che Passo!! It is a pretty old house, that seems to have been grafted onto a small church ( in use though I can’t imagine how many parishioners it would have). Our hosts are a delightful couple of 60’s hippy, bibbed-overalls, Woodstockers; she’s pregnant with twins. I could make a sepia-toned movie with David Crosby writing the musical score. Real hikers arrive, we all settle in, laundry gets hung out and we slowly watch the sun set as we wallow in mellowness. I can almost hear Country Joe and the Fish playing in the background. We have a farmhouse dinner, I have no doubt everything was grown in their backyard and it is, of course, vegetarian. The table seats a veritable United Nations – a Dutch couple, a Canadian (me), an Aussie couple, a young German woman, two women from France and our hosts, from Sicily and Italy. The conversation jumps from English to Italian to French and back. 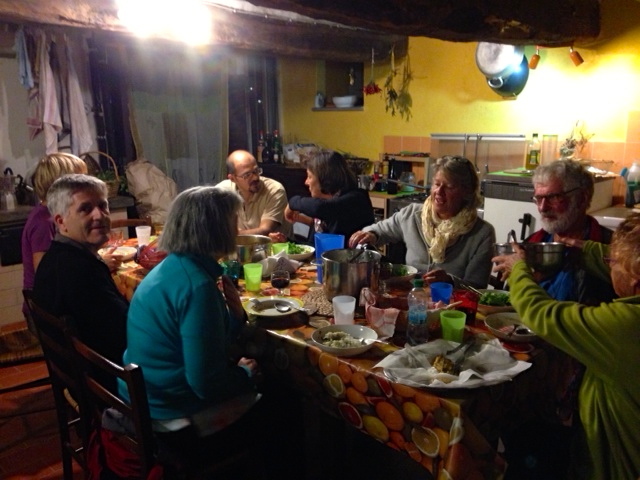 The next morning we all share coffee and bread, I buy two jars of their best home-made, wild cherry jam and we head out – buen Camino, this time the St. Francis one. Last example for now. The next evening, I’m eating plumbs and walnuts plucked from the ground under trees around us with Gabriele, my host and his family, in Pietralunga at a 15th century watch-tower that he has lovingly restored into an oasis-extraordinaire. 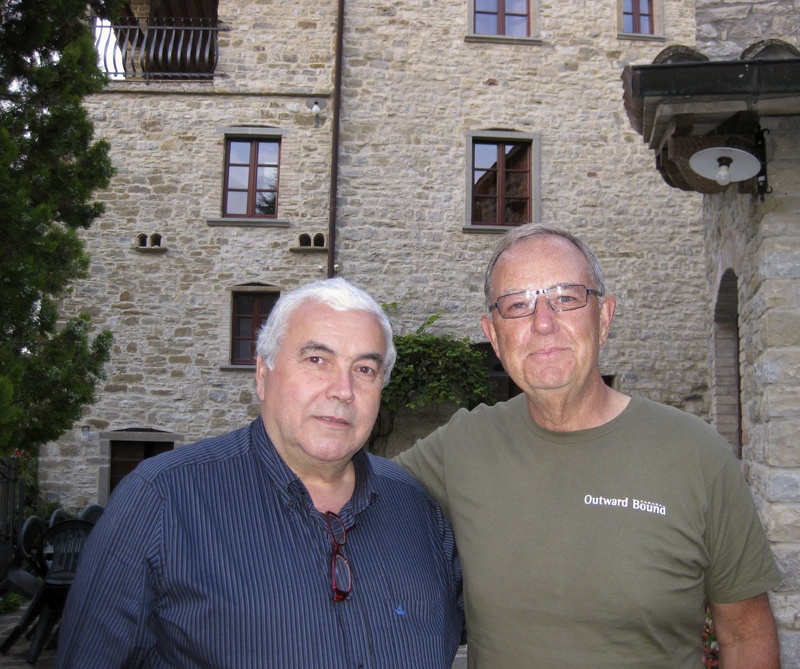 Italian hospitality has a name – Grazie, Gabriele! Some may fear unintended consequences; I’m making every effort to see joy in life’s unpredictability and embrace the Law’s messiness and infinite possibilities. 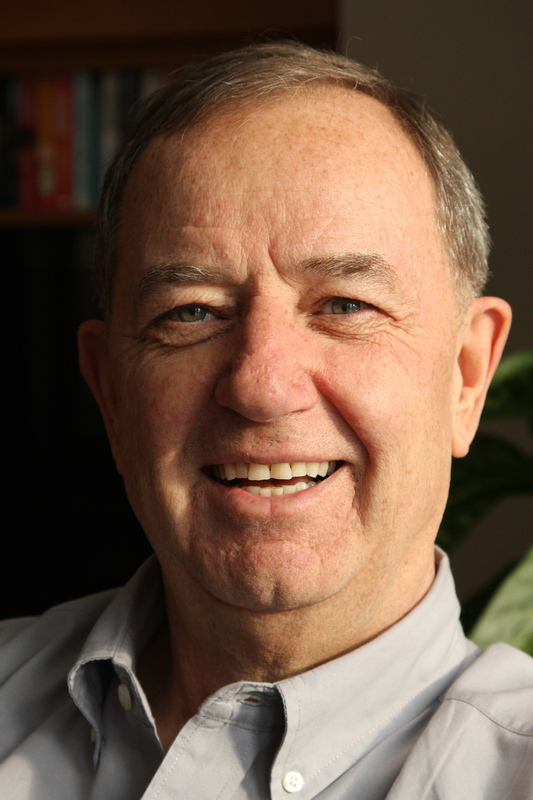 The Law of Unintended Consequences does present challenges. Traveling alone is not for everyone; alone is alone. No one has your back and there are periods of isolation, loneliness and ennui. As well, travel is drinking from the firehose of infinite consequences; everything is new and that can be both tiring and disorienting. This is why I do it – off the couch, out the door, out of my comfort zone. The sweet Spots are worth the challenges. For now, the Law is working for me. I’ll squeeze every last bit of juice I can from this lemon and make some lemonade. …and the Italian coffee, have I told you about the coffee…. 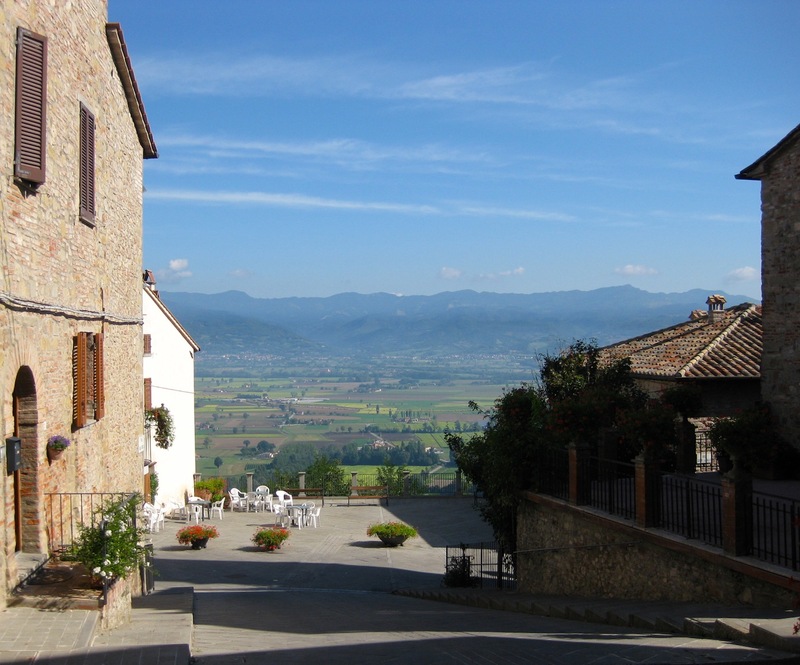 This entry was posted in Uncategorized and tagged Albergue, Che Passo, Citerna, Gubbio, middle aged fitness, midlife adventures, Off the Couch and Out the Door, Pietralunga, Pilgrimage of Assisi, Sansepulcro, St Francis way. Bookmark the permalink. 6 Responses to The Law of Unintended Consequences. Bob and skippy……. If you eat any more plumbs, you”ll be standing straight and walking tall in no time. Wayne and Helen. Hey Bro; I love the Law of Unintended Consequences. Glad you are having a great time. Love it. 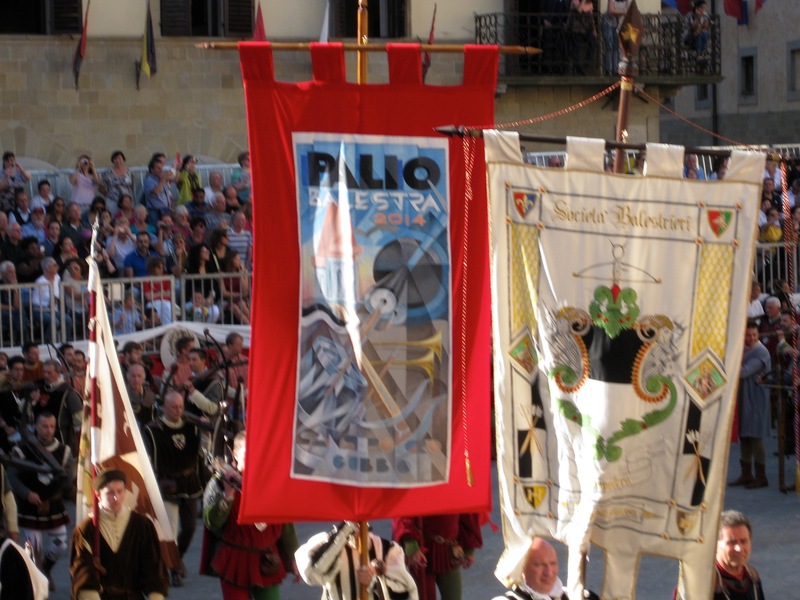 I also happened upon a festa in SanSepulchro when I lived one summer in Belforte. A lucky unintended consequence! How very exciting. Don’t be too shy to post the odd photo of food- the special things. All in moderation of course. Glad you are enjoying Italy as much as we did. Sounds fantastic. And you know,I agree with Bodhan, I don’t think anyone here would mind if you posted a food pic, although ordinarily, I am the first to disapprove! “the sweet spots are worth the challenges.” LOVE this Bob!!! and yes, please tell me about the coffee! !